All, please see the email below which contains radio adds we will have running in San Antonio and the surrounding areas until Election Day. English versions will be out next week, please like on YouTube, tweet or post on Facebook, asking people to support the effort so we can expand the outreach to the valley and around the state. The are posted on YouTube under Texas Freedom PAC. The Democrats are scared for their political lives down here. We have an opportunity to elect some good people and remove some bad ones. I appreciate your support and forwarding to your people. Subject: [Test] Fight for Texas Freedom "Keep Spanish adds on Radio"
Texas Freedom PAC "Enough is Enough; Hispanics are Republicans from now on!!" 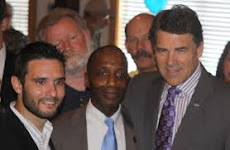 Texas Freedom PAC 10s "Hispanics are tired of the democrats"
Donate or Pledge by, November 1, 2012. For additional information please contact Weston Martinez, at 210-215-8785, or via email to texasfreedompac@gmail.com. Paid for by Texas Freedom PAC. Copyright © *|2012 Texas Freedom PAC*, All rights reserved.